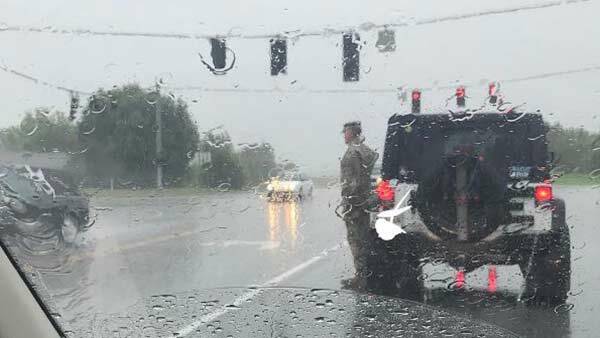 A photo of a soldier standing in the pouring rain to salute a passing funeral procession is going viral. Erin Hester of Vine Grove, Kentucky, shared the moving photo on Facebook and Instagram last week. "I was so completely touched by this today. A funeral procession was passing by and this soldier got out of his jeep to stand at attention in the pouring rain. I always get frustrated when I see cars that don't pull to the side and stop for a procession, but this gentlemen went above and beyond. I feel pretty confident that there isn't a military rule that soldiers have to do this. This made my heart happy to see the amount of respect that this gentleman showed a family that he doesn't even know," she wrote. Since July 6, the post has been shared more than 123,000 times on Facebook and has received more than 177,000 likes.